A simple NPC replacer for the two female hireable bards from Hearthfire DLC. 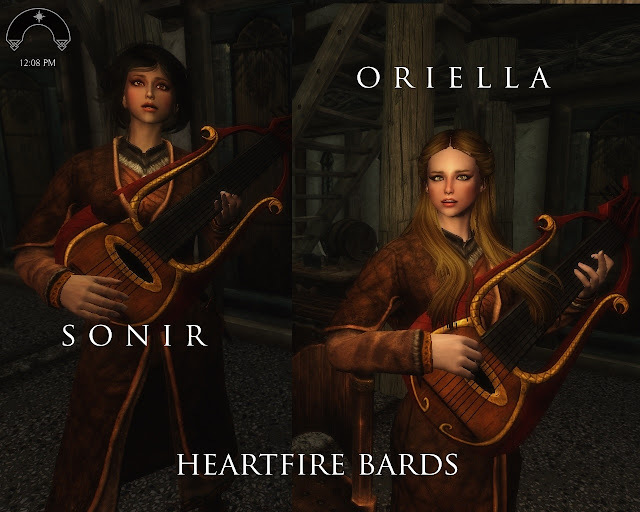 Hearthfire Bards sonir and Oriella replacer MEGA File Download. Also fixed Seon Player Bow, just look for it inside the knapsack in Seon's Cabin. Please read at least the GENERAL INFORMATION and the TROUBLESHOOTING before posting about an issue or CTD. On the comments, I won't reply to "It won't work" comments without explaining at least when it crashes (on Skyrim logo, loading a game, entering the house...). This mod replaces the two vanilla female bards added by DLC Heartfire that can be hired when you build the houses: Oriella (Heljarchen Hall) and Sonir (Windstad Manor). Requires Heartfire DLC only. I create this for myself, so if you don't like it, ignore this mod. It is a good idea to save your game away from both houses before installing to avoid CTD, if you already hire them. If you didn't hire them yet, just install and you should be fine. Incompatible with mods that alter Oriella and Sonir face and body meshes and textures (beautification mods that affect heartire NPC). To work with NPC overhauls that changes those two hireable bards, just place it in load order after any NPC overhaul (see troubleshooting below if you can't make it work). Problem: Their faces didn't change. Question: What about an overhaul to Llewellyn the Nightingale? I can't thank enough to them, without their permissions, resources, information and work I simply could't do anything. Kudos to all of them. - Face and Body Textures: Fair Skin Complexion http://www.nexusmods.com/skyrim/mods/51602/? - Eyes: JimtownIrish's for True Eyes http://www.nexusmods.com/skyrim/mods/49963/? tktk1 for Enhanced Character Edit by ECE team http://www.nexusmods.com/skyrim/mods/12951/? 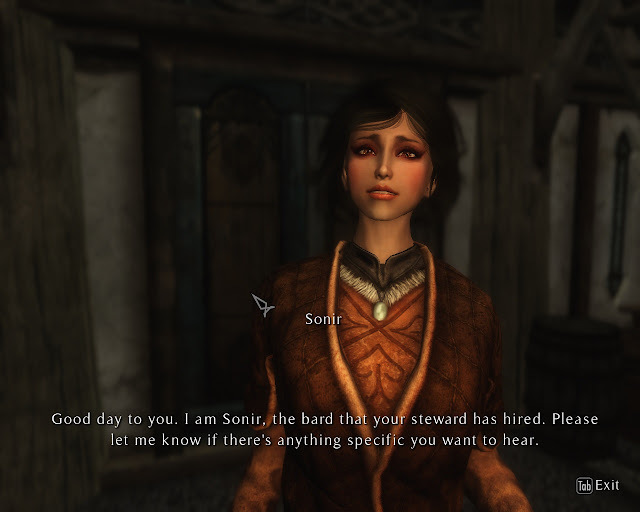 natilde for her Standalone Follower tutorial http://www.nexusmods.com/skyrim/mods/25673/? Nifskope, 3DSMax, Bethesda, Paint.NET teams.